There has to be a way to get everyone on the same page. You would think that over the last 6-7 years since the National Pressure Ulcer Advisory Panel (NPUAP) had released the updated staging guidelines we would have gotten better at this. Not necessarily the case. Lets try to make pressure ulcer staging as simple as possible. We will take out the all the extra verbiage; you can read that later on. We will break staging down to some user-friendly terms. Now remember, we are talking about pressure ulcers, so all of these skin injuries pressure had to be present, sure – friction and shearing can contribute, but pressure must be present. They are usually located over a bony prominence but we know they don’t have to be; they will be located anywhere the skin has had unrelieved pressure. If they are related to a device they will take on the shape of the device that has caused the injury to the skin. Stage I. This is an area of non-blanchable area of erythema (redness) of intact skin. That’s what it is. Period. Intact red skin. Non-blanchable is when we push on the skin it stays red; it doesn’t turn white or blanch. So, intact, non-blanchable area of erythema, a stage I pressure ulcer. Stage II. This is a superficial or shallow open area. We say it is pink, partial and painful. The damage is into the dermis here so the tissue we see will always be smooth pink/dark pink, not granulation tissue. Never will we see any necrotic tissue here; your wound won’t have yellow, black brown colors in it. It also may be an intact serum (clear fluid) blister. So there you have it; a stage II is a superficial open area with NO necrotic tissue or it can be an intact or ruptured serum filled blister. Stage III. This stage is easy. Damage is now into the subcutaneous tissue, but not through the subcutaneous layer. So this is the start of full thickness tissue injury. Now here is where we can start see slough, eschar, and granulation tissue in the wound bed. Tunneling and undermining may also be present in the full thickness pressure ulcer. 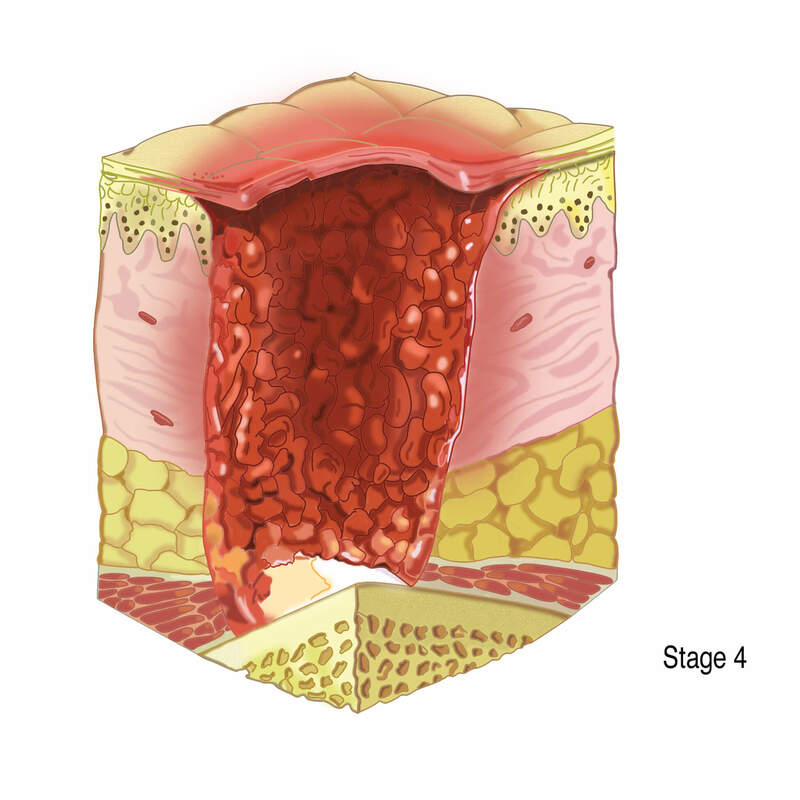 In the stage III pressure ulcer we may see healthy subcutaneous tissue, necrotic tissue or granulation tissue. What we WON’T see in the stage III is muscle, tendon, ligament or bone, ever. Stage IV. This is full thickness tissue damage where we now see muscle, tendon, ligament, or bone in the wound bed. The definition also states “palpable” so if we can feel tendon or bone here, we would stage it as a stage IV. Cartilage in the wound bed would be included in the stage IV pressure ulcer. We can have granulation tissue or necrotic tissue present in the wound bed as well. Undermining and tunneling may be present in a stage IV, but what I MUST see or feel are those underlying structures – muscle, tendon, ligament and / or bone present to say it’s a “stage IV”. Unstageable pressure ulcer is a stage we use to classify the pressure ulcer that has enough necrotic tissue present to make the clinician uncertain whether the pressure ulcer is a stage III or stage IV. So until enough necrotic tissue can be removed we place it in the “unstageable” category. Once that necrotic tissue is removed and we can evaluate the actual level of tissue destruction in the wound bed, that is when we will stage it and it will either be a stage III or a stage IV. Suspected Deep Tissue Injury (SDTI). To be a SDTI the skin must be intact, it must be purple or maroon in color or an INTACT BLOOD filled blister. Once this intact SDTI pressure ulcer opens up, we would then reclassify it based on our assessment or tissue type in the wound bed. We need to use the staging definitions set out by the National Pressure Ulcer Advisory Panel (NPUAP) correctly, and all clinicians who assess skin need to have a good understanding of these definitions in order to properly stage pressure ulcers. What was discussed about above is just a summary, there is more reading we need to do, but this will give us a good place to start with the staging. We need to start staging consistently across the healthcare continuum; it really just comes down to good wound assessment skills, knowing the tissue type that lies before your eyes and identifying the level of tissue destruction and applying them to the NPUAP staging definitions. Lets get this right! Description: Microcyn Wound Care is designed to clean, assist with debriding and moisten a wide spectrum of acute and chronic wounds without harming healthy tissue. Microcyn® is available by prescription only. Actions: Effective in cleaning biofilms: removes proteins and organic loads from wound bed. Rapid activity against a broad spectrum of gram-positive, gram-negative and yeast species including MRSA and VRE with the in vitro time kill of 30 seconds. Indications: Acute and chronic dermal lesions, Stage I-IV pressure ulcers, Stasis ulcers, Diabetic ulcers, Post-surgical wounds, Abrasions and Minor irritations of the skin. Pressure Relief Modalities for Wound Care- Exoskeletons? Pressure Relief Modalities for Wound Care are topics of concern that every wound care certified clinician must consider in their treatment plans for their patients. Some of the common pressure relieving devices include gel pads or cushions, position devices, low air loss and alternating pressure mattresses. Today, I caught a glimpse of what may help some patients in their fight against pressure ulcers on some parts of their bodies due to immobility and consistent pressure to certain parts of the body. Rex the Robotic Exoskeleton may sound like something out of the future, but I assure you the future has arrived. Check out the video below. From a wound care clinician’s perspective, I immediately was intrigued by what I saw in terms of what the future may hold for pressure relief, mobility management and treatment for patients that suffer from chronic pressure ulcers and wounds. So what are your thoughts on this type of technology and what it may mean to the treatment of patients with wounds? I know costs would be a concern, but we should consider the costs of long term wound care treatments and how technology advancements like the Rex Robotic Exoskeleton would mean. It appears that the quality of life for the young man in the video was considerably enhanced. What say you? Posted in Wound Care | Comments Off on Pressure Relief Modalities for Wound Care- Exoskeletons?